Our featherweight wrestling match started about eight o’clock each night. Bath time was a round of messy water battles, colorful plastic toys and slippery children. After bath time, my husband and I attempted to brush all 60 of their pearly whites (which was easier said than done). Finally, after a chaotic round of storytelling riddled with questions and comments, we put our three little children to bed. Sometimes, we repeated a quick, standard prayer and then cut out the lights. But there were nights when we took the time to really pray with our children. Sometimes, they made us laugh with their childlike requests. At other times, we had to discipline them. But there were also special times, when their simple, honest prayers touched my heart and I left the room with tears streaking down my face, grateful that I took a few minutes to pray with my precious babies. I wish we’d prayed with our children more than we did. I admit it was hard to find the time—and the energy—but when we did, it was so worth the effort. Maybe you’ve experienced the joy of praying with your kids or grandkids, too. While we made plenty of mistakes, I’ve learned a lot over the years about how to pray (and not to pray) with children. I hope to keep these things in mind as I look forward to praying with my grandchildren someday. Praying long-winded prayers with my active children just didn’t work. Since children have tiny attention spans, prayers need to be brief and to the point. I’ve learned it’s more effective to pray a few simple, well-thought-out sentences than to pray long, wordy paragraphs. If your prayer time is lengthy and unfocused, your grandkids may start to dread it. Rambling, marathon prayers usually don’t touch a child’s heart—or yours. And eventually, this can cause you to avoid praying together. I wish we had taken the time to pray more authentically with our kids, rather than repeating standard prayers and catchphrases. Since prayer is a conversation with God, it’s best just to talk to Him. When we finally decided to pray more genuine prayers with our kids, it became much more meaningful to all of us. 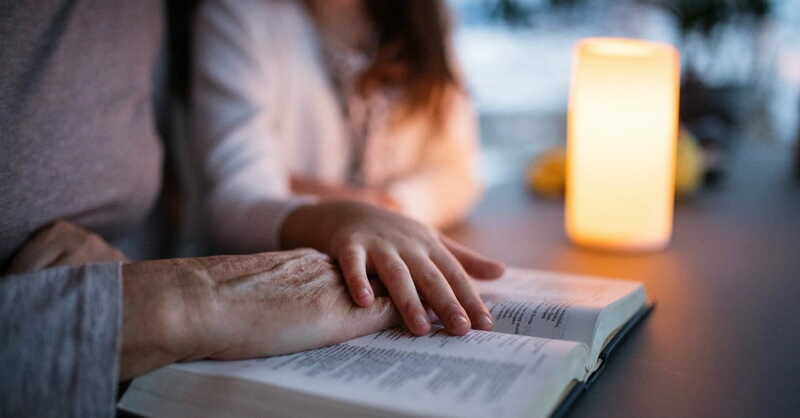 Using repetitions, clichés and “churchy” phrases can prevent your grandchildren from making a deep connection with God during prayer. Instead, use everyday language to pray about everyday things. Speak directly from your heart. Make each prayer personal and meaningful. Ask your grandchildren what they want to pray for. Remember that no requests are too big or too small for God, so even if your grandchild wants to pray for his goldfish or soccer game, it’s okay. There’s no one “right” thing to pray for. Recognizing a child’s requests makes prayer time more relevant and personal to him or her. 4. Resist handing out advice. Prayer is a conversation with God, not a time to give out helpful hints or a lecture. Often, I made the mistake of putting something in my prayer that I thought the kids needed to hear, but this was pretty obvious. If your grandkids expect a lecture at prayer time, believe me, they will begin to dread it. So, avoid lecturing. Never use prayer time to make your point. Be humble and authentic as you talk to God together. 5. Pray as your talk. Sometimes, my husband and I pray conversationally. We talk to God as if He were right there in the room with us. (When we pray like this, we try to do it respectfully). We’ve found that praying conversationally is more convenient (especially in a restaurant) and it doesn’t feel as awkward. 6. Pray God's promise over your grandchild. Briefly pray a promised blessing over your grandchild, then ask him or her to pray a blessing over you. This will give you an opportunity to pray for one another, instead of only praying for your own needs (Many of God’s promises can be found in Psalm 103). Here’s an example: “Lord, you promised to watch over us (Psalm 121:5), so I pray that you will watch over Will as he sleeps tonight. Keep him in your perfect peace. Let him know that you are right beside him, always.” Praying about God’s promises makes children more aware of them. It will demonstrate how blessed they are to belong to God, and it may inspire them to pray a blessing over someone else. 7. Pray a Scripture with your grandchild. This is one of my favorite things to do when I pray for other people. I personalize a Bible verse using someone else’s name and then pray it back to God. Praying like this is powerful and it gives Bible verses new meaning. Here’s how to do this with your grandchild: take a verse from the Bible and insert your grandchild’s name and needs, as appropriate. Write out the paraphrased verse with your grandchild and then pray it back to God, together. This makes the Bible come alive, giving your little one new understanding of God’s Word (Isaiah 49:15-16 can be easily paraphrased). If I’m not careful, I’ll rush straight to my wish list as I pray, forgetting to thank God or to even address Who I’m praying to. Since prayer is a real encounter with a real person, I don’t want to act as if I’m ordering from a catalog. Arranging my prayer to cover three “A’s” helps me remember that. Here’s how to “pray the A’s:” first, Acknowledge Who you’re talking to. Then take a minute to Appreciate what God has done for you. Then Ask for what you need. Establishing a prayer structure, such as praying the A’s, keeps prayers focused on God instead of on your requests. Having a prayer format makes it easier for children to follow along, and it lets them know when to chime in. We often think of prayer as a time to talk, but it’s also a time to listen and to be still. In the Bible there are numerous references to stillness and meditation (Psalm 19:14), but sometimes I’m so busy talking to God, I forget to be silent before Him. Maybe you can relate. To promote prayerful meditation, I’ve written a set of biblical meditations in my new study guide, A 40-Day Guide for Seeking God. Each meditation includes a Bible verse to be read aloud, followed by a moment of silent, focused meditation. Meditate (briefly) with your grandchildren, letting them experience quietness and waiting before the Lord. 10. Praise God in each prayer. David did this when he prayed, “You are forgiving and good, O Lord, abounding in love to all who call to you” (Psalm 86:5). Rather than starting with “God, we want this,” take a moment to praise God for who He is and what He has done. C.S. Lewis said that “praise not merely expresses but completes the enjoyment . . .” So, praising God as you pray enables you to enjoy it more. Help your grandchildren learn to praise God in prayer using their own words. If they can’t think of praise words on their own, let them borrow words of praise from the Psalms. Praising God deepens a child’s understanding and faith. It adds joy to prayer time. Often by the time God answers our prayer, we’ve forgotten that we prayed it. Writing prayers and answers down helps us remember. Making an “answered prayer list” with your grandkids can be a fun project, and it will help build their faith. Write out your grandchildren’s prayer requests and date them. If you receive an answer, write it beside the prayer and date it. I do this in my journal. Reading back over God’s answers is so encouraging! I didn’t realize how often the Lord says “yes,” until I started keeping a record of it. 12. Go ahead and ask for things—it's okay. Sometimes I shy away from asking God for too much at one time. If I pray for the lady down the street, and for my job, and for my children, I start to feel like I’m being too needy. But I’ve learned that God doesn’t despise needy people (hallelujah). He invites us to pray for every need (Philippians 4:6). In fact, there’s no limit to what we can ask. God is not like a genie in a bottle who limits us to only three wishes. Paul said, “God can do immeasurably more than we ask or imagine” (Ephesians 3:20). So go ahead and encourage your grandkids to ask for everything they need, and even for extras. It’s okay. God loves to give abundantly and He will grant what is best. Now, my three children are all grown up. My husband and I don’t have as many opportunities to pray with them as we once did, but now, we’re looking forward to praying with our future grandchildren. There’s nothing more meaningful than sharing your heart and faith with a little child that you dearly love. If you have grandchildren, remember the opportunity to pray with them is fleeting. Even though you may be busy or really tired, take the time to teach them about God. Pray with them and for them—it doesn’t have to be perfect or deeply theological—just pray from the heart. May Patterson has been writing and teaching biblestudy classes for years. Her new book, “Seeking a Familiar Face,” was birthed from a Bible study she wrote in 2014 called “A Time to Seek.” She was trained in small group dynamics for over ten years at Bible Study Fellowship, serving as a leader for four years. She has written for several magazines including Focus on the Family, Upper Room Magazine and iBelieve, among others. She is married to her dear friend, Mike, and they have three grown children. She loves to tell stories, laugh, and talk about the adventure of seeking God. For more information, visit http://www.maypatterson.com.